Love this! What a fun time as a family. Praying for you guys- all four of you! How sweet you are...our sweet little Isaiah!!!! 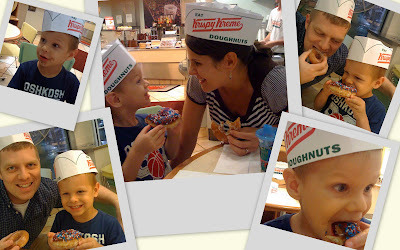 That sure does look like a lot of fun, honey.. wish Nana and Papa could gobble up some of them donuts! We love donuts! adorable pictures!!! hey, where did you find the cool display for your pics?? i love how you have them one on top of the other! you must show me how to do that. i'm always looking for new, fun ways to put pictures on our blog! sounds like things are moving along with the baby!! yippee!! i sure hope it is a boy, (they COULD BE wrong! :)) because i have a few boys baby things for him! keep us updated. we'll be praying over here for a speedy birth!